Brazil has long been a frontrunner in climate change policy and environmental diplomacy. The international conventions on climate change and biological diversity, for example, were born during the historic United Nations Earth Summit in Rio de Janeiro in 1992, and Brazil played a key role in crafting and implementing both agreements. That legacy is now at risk. Since he took office on 1 January, Brazil’s new president, Jair Bolsonaro, has dismantled several government divisions dedicated to climate change. The former army captain and far-right congressman has also named Cabinet members who are openly hostile to the fight against global warming. 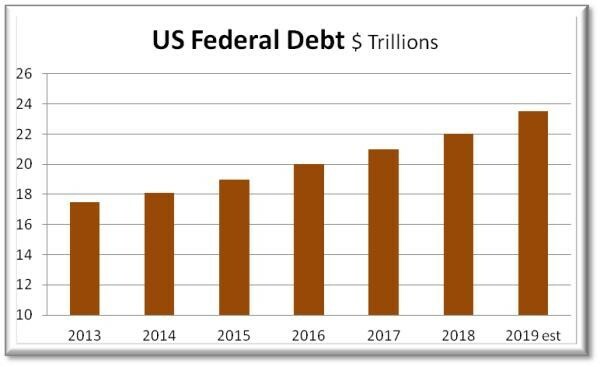 Like a life-long dieter who finally gives up and decides to eat himself to death, the US is now committed to trillion-dollar deficits for as far as the eye can see. And that’s – get this – assuming no recession in the coming decade. During the next downturn that trillion will become two or more, but in 2019 another trillion-plus is guaranteed. There are two ways of looking at the intersection of debt and population. One way says that if debt is rising population should also rise to allow future workers to pay for the retirement of today’s. More people thus make debt easier to manage. The other point of view is that debt and population soaring simultaneously creates a negative feedback loop that eventually destroys a culture. Today’s Latin America appears to validate the second thesis. Debt and population are both soaring, and big parts of the culture seem to be collapsing. It’s a construction project unlike any on our planet: it’s the size of Great Britain, and has been going on for 3,820 years, since the Pyramids were first built. But no humans have been involved in the huge landscape of 200 million mounds in Brazil – it was all built by termites. Researchers in northeast Brazil sampled soil in 11 locations and found that some of it began nearly four thousand years ago. The president-elect of Brazil signaled his desire to follow in President Donald Trump’s footsteps by relocating his country’s embassy in Israel from Tel Aviv to Jerusalem. Jair Bolsonaro posted on Facebook on Thursday he will follow through on a campaign promise regarding the embassy after he takes office.